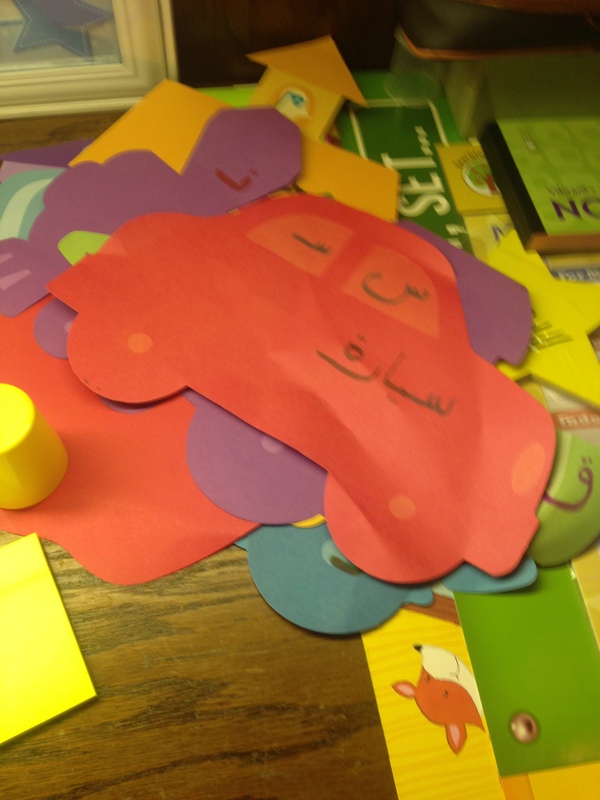 As a parent I have been trying to teach my daughter to be fluent in both Arabic and English. Keeping in mind that she is very little and it’s more important for her to explore her surroundings on her own, I started ever since she started talking and slowly but surely she learned the alphabet songs, thanks to Youtube videos and PBS kids. Then came the time when I wanted her to recognize and learn the names of the objects beginning with the memorized alphabets. Alhamdulillah, she is an inquisitive little girl and constantly points to different things around the house asking what they are called and soon enough her vocabulary started to develop. However, I have not been successful in teaching her to connect the letters to the sounds and to the words. She is 2 1/2 and wants to run and play, not sit for minutes looking at and repeating the same letter and word over and over. I would go online and search for projects that we can do together and found many that I wanted to do with her. 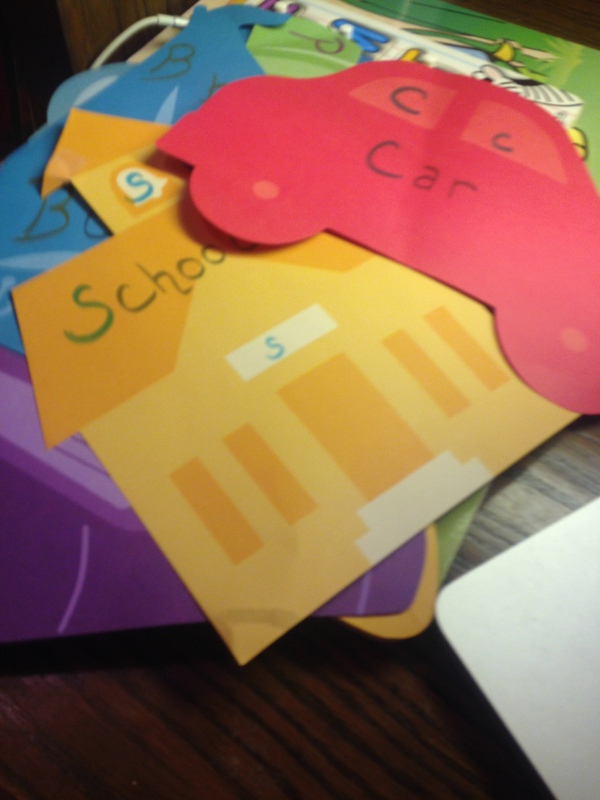 But with no printer and the twins at home, projects were near impossible to do. I, then, took a trip to the dollar store just to see what they have, and, oh, the treasures I found! One of these finds were packs of paper cutouts in the shape of cars, planes, bags, books, etc- items that teachers use to decorate classrooms. Once I saw it I knew exactly what to do with them. Later that night, and once all the kids were asleep, I got to work. Each cut out was duplicated, so on one I wrote the Arabic letter and word, and on the other I wrote the English letter and word that corresponded with the shape. Since then I have been doing just one word with her (both Arabic and English) each day and hanging it on the wall while reviewing the words we did the previous day. And let me tell you, it is working really well because she enjoys doing the daily word; especially since at the end of the lesson she gets a little certificate with her name on it that she hangs over her bed! Adapted from What The Fruitcake? Whisk together coffee, espresso powder and cocoa in a small bowl and set aside. Sift together flour, baking soda and baking powder in another small bowl and set aside. Measure out buttermilk and mix with vanilla extract and set aside. In a large bowl cream together butter, sugar and salt. Add eggs, one at a time, beating each egg in thoroughly and scraping the side of the bowl before adding the next egg. Add 1/3 of the flour mixture to the egg mixture and mix until combined. Add 1/2 of the buttermilk and mix until combined. Repeat, ending with the last of the flour mixture. Add the cocoa and coffee mixture and mix until thoroughly combined. Fold in mayonnaise. Divide equally into prepared cupcake liners. Bake for 16-18 minutes or until a toothpick inserted comes out clean. Allow to cool thoroughly on wire racks before frosting.